Rental brochure: on loan from the collection of Mark Tomasko. 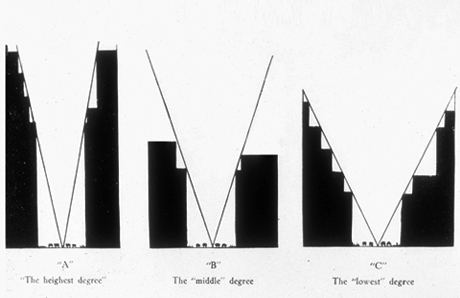 Model of the maximum zoning envelope created for the Museum by Reynan Punzalan after a drawing by Hugh Ferriss in The Metropolis of Tomorrow (1929). 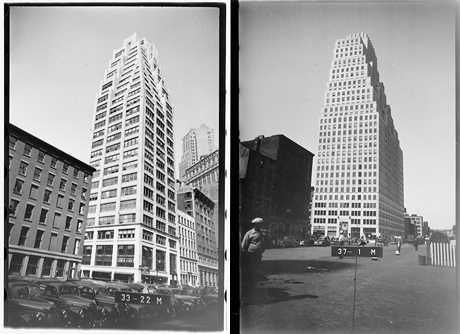 Left wall: Copy prints of tax photos of the 1940s: at left, 99 Wall Street; at right, 120 Wall Street, NYC Municipal Archives. Wall Street slices diagonally through the frame, ending at the East River with the ziggurat of 120 Wall Street. The rental brochure in the front of this case shows the same high-rise as a solitary mountain at the foot of the street, rising from the plain of 19th century counting houses. 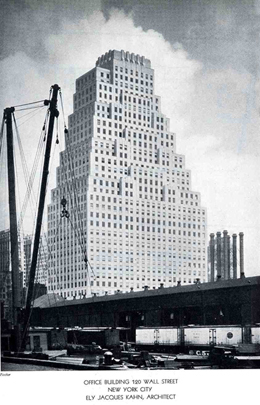 Completed in 1930, the 33-story skyscraper designed by the Art Deco master Ely Jacques Kahn rose in eight stages and was a precise expression of the template dictated by the city's 1916 zoning law, including the dormer projections. 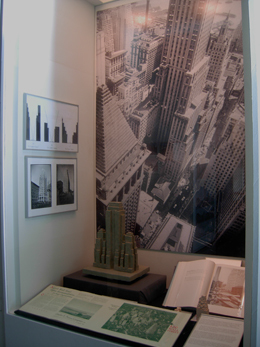 The influence of the zoning law on New York's skyscraper architecture was profound, producing the setback forms and slender towers that characterized the skyline. 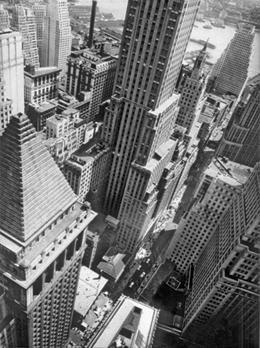 Especially in the financial district, where the zoning formulas were most liberal for development, the cliff-like terraces of the shallow setbacks created the stunning canyons of steel and stone.